Hera Roberts at a reception on board the Dutch light cruiser Java moored in Circular Quay, Sydney, 10 October 1930. Samuel J Hood, ANMM Collection. 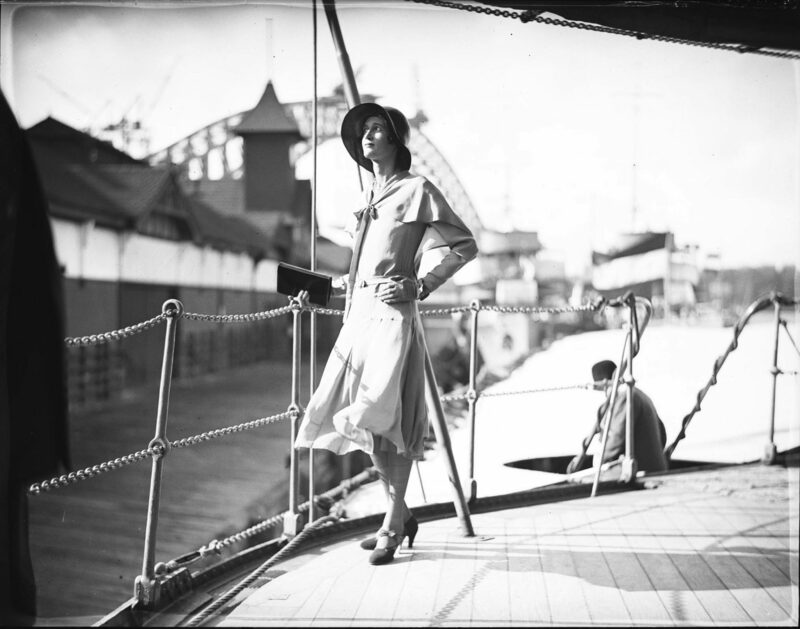 A FASHIONABLE, MODERN WOMAN of the 1920s poses with elegant nonchalance on board a dutch cruiser, while the nearly completed Sydney Harbour Bridge creeps to a peak just behind her head, forming the perfect composition. She and the photographer, Samuel J Hood, could have no way of knowing the stir this shot would create on the photosharing website Flickr Commons, 82 years after it was taken. The mystery of who she was has formed the basis of an exhibition on show at the museum from 26 February to 9 June, inspired by the museum’s Flickr followers. For months the woman’s identity remained a mystery – until one Flickr follower, who goes by the username ‘quasymody’, spotted Hood’s striking photograph in the November 1930 edition of The Home magazine. Finally, the Sydney painter, designer and socialite Hera Roberts was no longer that elusive face without a name. In the days following the discovery, more research from other dedicated Flickr followers ‘beachcomberaustralia’ and ‘pellethepoet’ flooded in, unlocking Hera’s fascinating story (see also Signals 102). Hera Roberts was an arbiter of taste for everything Art deco, but our detectives learnt that she was also a muse to many Australian artists and photographers. Max Dupain and Harold Cazneaux both captured beautiful photographic portraits of her, and painters Thea Proctor and George Lambert also paid homage to her beauty. As with Hood’s shot, they all depict Hera’s slender neck as her defining characteristic. One 1929 advertisement went into more detail and seems to echo the spirit of Hood’s portrait, describing Hera as an ‘uncommon beauty’ with ‘cameo-cut features’ and an ‘exquisitely shaped head, set proudly on a throat that must be the despair of any artist’. 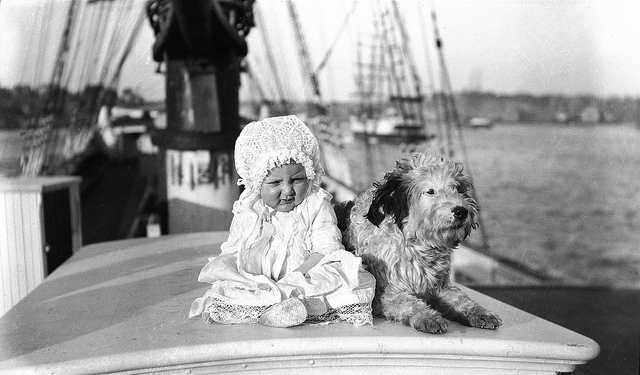 Baby and a dog on a sailing ship. Samuel J Hood studio, ANMM Collection. What seems to stand out most in this story is that without our Flickr followers, Hera’s tale might never have been unearthed. For many years, this pretty woman and her story lay hidden among the 9,000 or so other photographs in the museum’s Hood collection. In a way, Hera now stands as a symbol of how digital communities are rejuvenating cultural collections and transforming museum practices. In making our historic photographs available online, we are opening up our collection to a far greater audience than we could ever achieve through exhibitions alone. We are finding that this increased access to the collection prompts the community to respond, so contributing to the interpretation and creation of history. The exhibition #HoodsHarbour endeavours to honour the contributions of our self-described ‘armchair archaeologists’, or as we like to call them, our Flickr ‘super sleuths’. It contains a small selection of the most popular Hood photographs on our photostream. In a sense, #HoodsHarbour represents the power of the online community members who have returned each day to our feed to comb through the collection and unlock its secrets. Though #HoodsHarbour contains only a handful of the many discoveries that have been made and indeed continue to be made, it’s the museum’s first example of an exhibition that has essentially been chosen by the people. Nicole Cama for the digital team. NOTE: This article was originally published in Signals magazine, Issue 106, Mar-May 2014, p 77. Reproduced courtesy of the Australian National Maritime Museum. See also the exhibition blog. Below, a slideshow via Flickr Commons featuring the photographs from #HoodsHarbour.